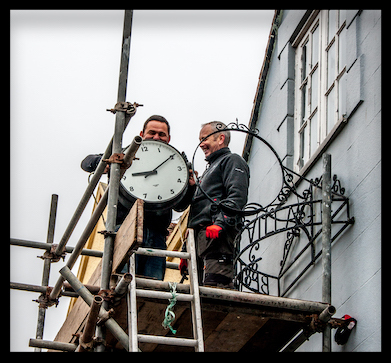 The clock on the house next to the chapel has been taken down and is looking for a new home. The clock celebrates the village winning the Hampshire Best Kept Village competition in 1987 and once again the following year. The Titchfield Village Trust were instrumental in driving forward the Best Kept Village project. After winning the competition for the second year running it was decided to commemorate the award by erecting a clock in a prominent position in the village. The TVT chairman at the time, said, “It will serve as a permanent reminder to all the villagers and a proud boast to all our visitors”. The clock, which was unveiled by Fareham’s Mayor, Dorothy Ekins in 1988 will be kept safe until a suitable home can be found for it.